Following the runaway success of Jaws in 1975, filmmakers fell in love with movies which featured dangerous animals. Of course, "animal amok" films had existed before this time, most notably Hitchcock's The Birds, but this new crop of movies really ran with this idea and we got movies like Grizzly, Alligator, and The Swarm. What do these movies have in common? They feature animals which can actually hurt or kill humans. As time went on, there were fewer and fewer animals to choose from and things got, well, sketchy. In 1982, British author Shaun Hutson wrote a novel called Slugs, which dealt with, you guessed it, killer slugs. Who would have thought that six years later, that book would be brought to the screen in one of the weirdest creature-features ever. Ashton is just a normal American small town. Until Ron Bell (Stan Schwartz) is found dead in his dilapidated house. Health Inspector Mike Brady (Michael Garfield) and the Sheriff (John Battaglia) investigate the scene and Brady notices slime trails leading into the basement. When three more people die under mysterious circumstances, Brady enlists Sanitation Director Don Palmer (Philip MacHale) to look for clues. After his wife (Kim Terry) finds a large slug in their garden, Brady begins to believe that carnivorous slugs are taking over the town. Brady consult with high school science teacher John Foley (Santiago Alvarez), who creates a weapon to be used against the creatures. But, will anyone else believe Brady? OK, a slugs slimy and gross? Yes. Are they creepy? Maybe. Are they threatening? No. So, right out of the gate, Slugs suffers from a huge problem. Slugs themselves simply aren’t intimidating and I think that most of us could easily outrun them, even if they are in a pack (or whatever a group of slugs is called. A smear?) Some of the other movies in this genre may present some questionable science, but they at least bring us animals that are fast enough and fierce enough to attack people. It would seem that one would have to be asleep to be attacked by slugs. One can’t help but wonder if Hutson wrote his book as a goof, and whether or not the movie should be taken seriously. But, that’s part of the odd charm of this movie. From the outset, everything is played very seriously. First of all, there is nothing silly about the deaths. Some of them occur off-screen, while others are quite gory and uncompromising. Sure, we want to giggle at the actors wallowing in slugs, but as they are losing their eyes and hands, it’s all very dark stuff. Secondly, the story is played very straight. The very earnest Mike Brady (did they know that people would giggle at that time) travels the town in his station wagon attempting to convince town officials that killer slugs are on the loose. He and Don hatch a plan as if Ashton were being invaded by rampaging monsters, not slimy black things which sort of just sit there. The movie never questions the fact that the slugs have endangered the entire town, and therefore we don’t either. Slugs comes to us from Spanish Director Juan Piquer Simon (AKA J.P. Simon), the “auteur” who also brought us Pieces. Just as that film never questioned how someone could wander a college campus with a chainsaw and not be noticed, Slugs never drops its intentions to be the best darn killer slug movie that it can be. Of course, despite the movie’s best intentions, we don’t take much of this seriously, but that doesn’t stop Slugs from being a hoot. No, the slugs aren’t scary, but one can’t help but marvel at how the movie soldiers forth, piling up bodies, staging gory death scenes, and offering a scene where I was convinced that Don was seducing his housekeeper. The film moves along at a nice pace and at least two of the deaths are unforgettable. Is Slugs a good movie? Not really, but it’s the kind of shameless foreign-made (but shot in America) monster movie that we rarely see anymore. You probably won’t like Slugs, but you’ll enjoy it. 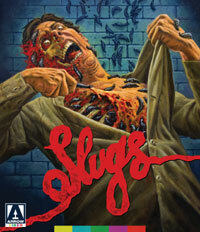 Slugs apparently takes place in a world without salt on Blu-ray Disc courtesy of Arrow Video. The film has been letterboxed at 1.85:1 and the Disc contains an AVC 1080p HD transfer which runs at an average of 32 Mbps. The image is sharp and clear, showing only slight grain and a few trace source defects from the source materials. For the most part, the colors look good, only looking slightly washed-out in a few shots. The image is never overly dark or bright. The level of detail is relatively good, but some scene do show off a distinctly 80s soft look. The depth is OK, but the transfer carries a flat look which can plague movies for this era. The Disc carries a Linear PCM Mono audio track which runs at 48 kHz and a constant 1.5 Mbps. The track provides clear dialogue and sound effects. Being a mono track, we don’t get any dynamic effects here, but the score and talking come through with no problems or hissing. The Slugs Blu-ray Disc contains a nice selection of extras. We begin with an AUDIO COMMENTARY from author Shaun Hutson and documentarian Michael Felsher. This is followed by a second COMMENTARY featuring filmmaker Chris Alexander. "Here's Slugs in Your Eye" (8 minutes) is a modern-day interview with actor Emilio Linder, who played the man that ate the slug-ridden lettuce in the film. He talks about his career and his experience on Slugs. "They Slime, They Ooze, They Kill" (11 minutes) is another new interview, this one with special effects artist Carlo De Marchis, which confirmed my suspicion that the exploding house was a model. We hear from Art Director Gonzalo Gonzalo in "Invasion USA" (12 minutes). "The Lyons Den" (21 minutes) has production manager Larry Ann Evans take us on a tour of the locations in Lyons, New York. The final extra is a TRAILER for the film.